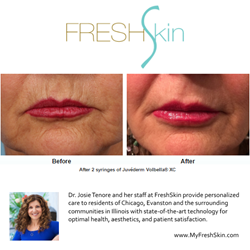 Josie Tenore, M.D., founder of FreshSkin, has been chosen among the first physicians in Chicago to receive a shipment of Juvéderm Volbella XC. Juvéderm Volbella® XC has been approved by the FDA for lip augmentation and correction of unwanted perioral rhytids (smoker’s lines). Josie Tenore, M.D., founder of FreshSkin, has been chosen among the first physicians in Chicago to receive a shipment of Juvéderm Volbella XC. This is an exciting achievement. Volbella is the latest member of the Juvederm family. It’s like the very popular Voluma XC, but is a thinner consistency and can be used superficially. It has been approved by the FDA for lip augmentation and correction of unwanted perioral rhytids (smoker’s lines). Because of how it’s manufactured (using Vycross® technology) Volbella is not only smooth and soft to inject, but lasts much longer. Ideal candidates will be anyone who has these lines and wants them corrected quickly without much downtime, lasting up to 12 months. Many patients travel long distances to visit Dr. Tenore , from multiples states and international countries, including Canada, Australia, and England, to experience her customized facial restoration procedure. This new product offering will allow these patients in particular, to be able to schedule follow up visits annually, allowing for a more convenient experience and also great savings in time and expense. Juvéderm Volbella XC will not be available nationwide until later this year, however FreshSkin will have it available for patients this October 2016. Dr. Josie Tenore completed her medical training at the University of Toronto, in Toronto, Canada, in 1984. Her belief in continuing education to expand her knowledge and skills led Dr. Tenore to receive training in varicose vein treatments in 1986 and chemical peels and skin care in 1988. In 1998 she earned a Master’s of Science degree in public health from Harvard University. This provided her with an opportunity to work with world-renowned specialists and offer state-of-the-art medical care to her patients. She also has a passion for educating others. Dr. Tenore has taught at several medical schools: her alma mater, the University of Toronto; Brown University in Providence, Rhode Island; and Northwestern University in Chicago, Illinois. In addition, she has authored many scientific articles in well-recognized medical journals. FreshSkin is located in Highland Park, Illinois and specializes in integrative and cosmetic medicine. Specializing in nonsurgical and noninvasive techniques to restore a youthful, refreshed appearance, Dr. Tenore brings more than 30 years of experience to each patient. To get more information on FreshSkin, or to schedule a complimentary consultation with Dr. Tenore, contact the office at 847-681-8821. Take a look at FreshSkin reviews and testimonials at http://www.myfreshskin.com.